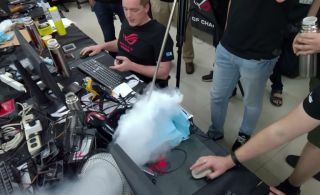 If you're into the extreme overclocking scene, then you might be familiar with Asus' Absolute Zero event. It's basically a sponsored gathering of some of the world's top overclockers who chase speed records using extreme cooling. During the most recent event, German overclocker 'der8auer' pushed an Intel Core i7-7700K CPU to 7.2GHz. These events focus on processors that can function at very low temperatures. With that being the case, participating overclockers not only turn to liquid nitrogen, but also liquid helium. It's more expensive but is also cooler at around -269C (about 70C lower than liquid nitrogen). The nearly 15-minute video is an interesting watch because of the amount of detail involved. Der8auer even talks about his experience traveling to Taiwan and seeing some of the sights. If you want to skip that part, fast forward to around the 5m10sec mark. That's when he starts talking about the hardware. He explains that the first part is to get used to the hardware. Asus has a team of engineers that attend these events and who can offer support. However, the overclockers are not given any guidance on things like how far they can increase the voltage. So, after getting used to the new motherboards, overclockers embark on playing with the CPUs. Some of them get destroyed throughout the process, "but it is how it is." There is a lot of trial and error involved in finding out voltage limits. Overclockers also have to figure out which CPUs work best with certain cooling methods and benchmarks. This can take days of testing. The culmination of all this work is that der8auer took a Core i7-7700K to 7,328MHz using liquid helium, which costs about €4,000 euros for 100 liters—yikes! There is a lot of information to digest if you watch the full video, though one of the more interesting tidbits is that der8auer got his best results by leaving all cores enabled and leaving Hyper Threading turned on. That usually is not the case when doing extreme overclocking, but that's what worked for him in this case.